Summit? What summit? That seemed to be the reaction of traders here yesterday if the stuttering share index was anything to go by. 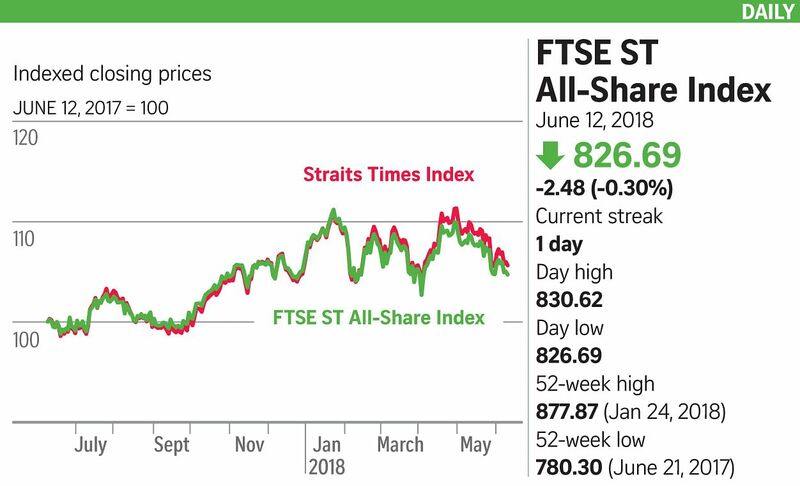 The key Straits Times Index stayed in the red for most of the day after logging brief gains in the early hour, only to retreat 11 points or 0.32 per cent to finish at 3,430.69. Turnover was subdued with 1.69 billion shares worth $967.9 million traded, with losers outpacing gainers 227 to 155 counters. The outcome was mixed elsewhere with South Korea's Kospi down 0.05 per cent, while key indices in Japan, Hong Kong and China gained but Malaysia finished in the red. Local investors seemed less interested in geopolitics than with what lies ahead on the data front this week. This includes May inflation figures and real average earnings growth out of the United States. There are also meetings of the US Federal Reserve and European Central Bank. "It is almost the done deal for the Fed to hike its interest rate for the second time this year. However, the key focus will be the dot charts as well as terminal rate, which market will assess whether the Fed rate hike will be three or four times," said OCBC Bank. Never too far behind are fears of a global trade war, particularly after the hostile ending of the weekend's G-7 summit and the potential retaliatory measures by US allies. The end of the week brings another key risk event as it marks the deadline for the US to unveil the list of Chinese imports to be taxed by additional levies. ING chief economist and research head of Asia-Pacific Rob Carnell said trade is a major risk. "The EU (European Union) is ready to put tariffs on the US on July 1. I anticipate retaliation for their retaliation to follow soon after, and then some retaliation to that retaliation - this gets ugly fast. It is on a global scale. And there are no winners," he said. Singtel closed unchanged at $3.24. In a sector update report, UOB Kay-Hian called a "buy" rating on the telco given its defensive qualities, chiefly due to its geographical diversification. Yangzijiang Shipbuilding Holdings slipped one cent to 98.5 cents. The counter was the day's fifth most active with 21 million shares done. The stock has lost 34 per cent so far this year. At current prices, OCBC Investment Research deems the counter a "buy", given the group's "strong execution capabilities", net cash position and positive operating cash flows over the past four years. Its share buyback plan could further lend support to the share price.